ICLA is an NGO registered in Switzerland. In this first newsletter of 2014 we report on our current activities that are outlined under the headings below. We also would like to highlight an event that has been organised by the Hudson Institute that will be of interest to our supporters as it relates to an issue that we have been working on for some time. Event date and time: Friday, January 17 at 12:00-1pm (Washington D. C. time): In addition to the work of ICLA outlined below, you may also be interested in the following upcoming event that has been organised by the Hudson Institute: The Organization of Islamic Cooperation: Free Speech Implications of a Proposed Ban on “Islamophobia”. This event will feature Mark Durie who is an Anglican pastor, theologian, author, and human rights activist, and it will be moderated by Nina Shea. This Declaration was a response to the Istanbul Process and the efforts of the Organisation of Islamic Cooperation (OIC) to create a global blasphemy law and, in line with the 1990 Cairo Declaration for Human Rights in Islam, make all make all human rights subject to the Islamic sharia. Our intention was, and is, to provide a counterweight to such proposals. We tabled theBrussels Declaration on 9 July 2012 at a conference in the European Parliament. We introduced it to the public via our 11 July 2012 press release. The Declaration described and launched a systematic ‘Brussels Process,’ designed to stimulate public debate on the conflict between sharia and liberty; to provide a counterweight to the efforts of the OIC to impose blasphemy laws in Europe and other countries; to re-establish standards of good governance and reasonable foreign relations based on the UN Declaration of Human Rights and national constitutions; and to reject the Cairo Declaration on Human Rights in Islam as a basis for any discussions on human rights and civil liberties. Working Groups for the Brussels Process were organized to develop legislative initiatives and briefings for policymakers and the media, in order to work to implement the Brussels Process as a moderate and prudent approach to protect free expression and human rights. The Brussels Declaration was developed with ongoing consultation with legislators in several countries. More information about the conference: Speakers; Defender of Freedom Award; Brussels Process Journal. We launched our definitions project at the Organisation for Security and Cooperation (OSCE) Human Dimension Implementation Meeting in Warsaw in late September along with some of our partners in the field of human rights. We had long had concerns about the way the term ‘Islamophobia’ had been used as an instrument of demonization and a mechanism to destroy freedom of expression rather than a tool to enhance human rights. In May 2013 we published an essay that turned the concept of Islamophobia on its head by defining it as “The Irrational Fear of Questioning Islam”. In our view this was a more honest definition of a term that incorporated the word ‘phobia’. Working with our partners from Mission Europa Netzwerk Karl Martell (MENKM) andBürgerbewegung Pax Europa at the earlier OSCE meeting in Vienna in July 2013, we became aware of a guidebook jointly published by the OSCE and others about Islamophobia. This booklet, “Guidelines for Educators on Countering Intolerance and Discrimination against Muslims: Addressing Islamophobia through Education”, perpetuated the concept as a tool of demonization. As a result Dr. Harald Fiegl (on behalf of MENKM) requested a definition of the word and obtained a response from the Turkish representative that we subsequently used as the basis of our OSCE work in September. In line with our Brussels Declaration we also called upon the OSCE to repudiate the 1990 Cairo Declaration. In September we presented a white paper to the OSCE entitled “The Problematic Definition of ‘Islamophobia’” in order to demonstrate the problems with the term and made the public aware of this via a press release. We followed this up by organising a side event at the OSCE meeting entitled “How Bad Definitions Violate Fundamental OSCE Commitments” and called upon the OSCE to Publish An Unambiguous And Politically Neutral Definition Of Islamophobia. We also attended a side event organised by the OSCE Office for Democratic Institutions and Human Rights who published the booklet mentioned earlier and put forward our position on the subject. Other interventions by ICLA and like-minded organisations at the plenary meeting can be found HERE,HERE, HERE, and HERE. We have followed up our work on Islamophobia by making regular comments on social media and continue to do so. Our latest initiative, the Victims of Sharia Action Network (VOSAN) was launched on United Nations Human Right Day 2013 (10 December). The purpose of this project is to highlight the problem of sharia-inspired human rights abuses around to world to mobilize public opinion and action on behalf of the victims of sharia. We have already highlighted a case in Egypt and a case in the United States. We will move forward with this project and cooperate with other stakeholders to take this forward in 2014. If you are aware of any victims of sharia or represent an organisation that wants to participate in the project then please let us know. VOSAN is explained in more depth HERE. 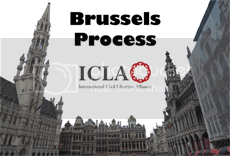 In early December 2013 ICLA’s Chairman was engaged in outreach work in the European Parliament in Brussels. Good relations were developed and there is a possibility that ICLA will have the opportunity to participate in a conference in 2014 that relates to our issues and mission. ICLA will certainly be lobbying and working with allies in the European Parliament to get the problematic definition of Islamophobia, and the erosion of basic freedoms caused by the sharia lobby onto the political agenda ahead of the European Parliamentary elections in May 2014. On February 15, 2011, the Austrian human rights defender Elisabeth Sabaditsch-Wolff was convicted of “hate speech” in a Vienna courtroom for what she had said in a private seminar about Muhammad and Islam. The original charge was “incitement to hatred”. On the second day of her trial, the judge at her own discretion added a second charge, “denigration of religious beliefs of a legally recognized religion.” Elisabeth was acquitted of the first charge, but convicted of the second. She was sentenced to pay a fine of €480. She eventually appealed her case to two higher-level courts in Austria, and the verdict was upheld in both instances. The Austrian Supreme Court stated that Article 9 of the European Human Rights Convention (Freedom of Religion) supersedes Article 10 (Freedom of Expression). As the defense attorney considers these verdicts to be in violation of fundamental human rights, he has now taken the case to the European Court of Human Rights, which will be the final arbiter in this conflict freedom of expression and protecting religious beliefs from denigration. 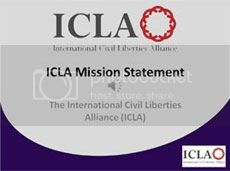 ICLA believes that this conviction represents an attack on basic freedoms in Europe, especially in relation to the right to freedom of expression and will continue to offer Elisabeth its support and encouragement. We would like to thank Elisabeth for the work she has done for us and for human rights and the cause of freedom.